The first and most important thing to say about bike parking is that in Hanoi motorbikes are extremely easy to steal. They can be gone in the blink of an eye. The steering lock can be forced by leverage and the wheel lock can simply be bent to be rendered ineffective. It’s so easy. At home you should try to keep the bike away from prying eyes and behind securely locked gates and a fence that are tall and that hopefully have something sharp on the top. Tall gates are no exception. The lock on your gate should be of good quality and so should the part of the gate or fence that you are locking. It isn’t unheard of for thieves to leave a padlock intact and cut the gate around the lock. As is it not also unheard of for thieves to lift bikes over fences up to two metres or more high. We suggest keeping a bike inside the house, in a locked garage or behind the house out of sight rather than in a front courtyard where it can easily be seen and stolen when you are not at home. If you lose the ticket there could be a fine and it will be difficult to get the bike without the registration documents, which you do not hold. Call us to help you in this situation. There are times when leaving a copy of a passport and a letter to say you take full responsibility can persuade a guard to let you take the bike but these are rare. You will normally need to contact us to get the bike for you and it can be troublesome. DON’T lose the ticket! Find out how long you can keep your bike in the bike park. Often these places will be forced by the police to shut at midnight. If you have not collected your bike by then it will be impounded by the police who will then possibly only release it to the staff at the bike parking, even though it is OUR bike, so that they can claim payment for their inconvenience. This again makes it difficult to get the bike quickly and causes frustration for everyone. With parking tickets, you will either have one with a number on it and the guard will then mark your bike with that number or they will note down your registration number. 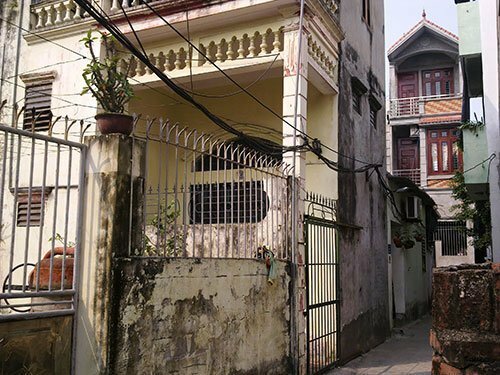 As a rough guide you can expect to pay between 3,000 to 10,000VND for a short stay but this will differ depending on location, time of day, public holidays etcetera. We cannot advise on overnight charges as we won’t leave a bike overnight. However, the image above shows the day (ban ngay) and night rates (ban dem). It goes without saying that you should endeavor to find out how each different place works before leaving a bike there. Bike parking in a basement. A mix of the above advice applies to parking in your apartment. There could be the additional procedure of registering the bike with the guards but this is usually simple and your landlord is the one to do this for you really. Again find out how things work first, then leave your bike there. If you are going to leave the bike outside a shop, then check that it is ok for you to do so. The owner/ staff will often let you know very quickly if you have put your bike in the wrong place and tell you where to put it. Do take their advice as they spend a lot of time in that location and know exactly what is best for all concerned. If you park illegally it is likely that the police will impound the bike. This then means we will need to find the local police station that has the bike. Show them the registration documents. Ask if they are going to fine you. Pay the fine, which is in a different office as, contrary to popular belief, police do not accept payment of fines. Return to the police station and ask for the bike back. It is long-winded and tiresome. Please park in the correct place. Never cause a fuss or raise your voice at the police it will cause a lot of difficulty and no one will appreciate it. Get angry with yourself on the way home. Parking outside of a cafe. If you leave the bike outside a bar or restaurant that you use then tell them so and they will usually show you where to park or have someone park your bike for you. Then if there is any problem the owner/ manager should be responsible and take care of it. However, there are more and more dodgy bars that are opening late at night and, in our opinion, your bike is not safe. We have had cases where we feel the staff at the bar know exactly where a missing bike is but will not let us know. Take a taxi or xe om; Pay 50,000vnd and not risk losing your bike or having an accident due to drunk driving! Leaving the bike on the street and not in bike parking is only really an option if you are going to be somewhere for a very short time. In that case it is best to use the steering lock and the front wheel lock whilst you are not with the bike. Check that you have the keys beforehand. DO NOT leave the bike with anyone other than a bike park attendant who gives you a ticket and with whom you see other (Vietnamese) people leaving their bikes with. If you leave the bike with a random stranger (yes, it has happened!) you will at best get the petrol stolen. Parts could be exchanged and the bike could be left for the police to pick up or, at worst, be stolen and sold off as parts. It sounds obvious as does some of the other snippets here but these things do happen. If all of this has got you worried about the risk that you are taking by having a motorbike, don’t be. Simply put: If you wouldn’t do it back home, don’t do it here. As long as you follow the guidelines above and have an ounce of common sense, you should stay out of trouble. As long as you follow the guidelines above and have an ounce of common sense, you should stay out of trouble.